(Reuters) – The chief executive of French oil major Total, Christophe de Margerie, was killed when his private jet collided with a snow plough as it was taking off from Moscow’s Vnukovo airport on Monday night. De Margerie’s death leaves a void at the top of one of the world’s biggest listed oil firms at a difficult time for the industry as oil prices fall and state-backed competitors keep them out of some of the best oil exploration territory. The collision occurred minutes before midnight Moscow time as de Margerie’s Dassault Falcon jet was taking off for Paris. Russia’s Investigative Committee said the driver of the snow plough had been drunk and that a criminal investigation had been launched. The plane’s three crew also died, said Total. The airport said visibility was 350 meters (1,150 feet) at the time of the crash. Vnukovo is Moscow’s oldest and third biggest airport. Located southwest of the capital, it is used by Russian President Vladimir Putin and other government officials. 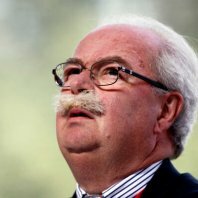 De Margerie, 63, had attended a Russian government meeting on foreign investment in Gorki near Moscow on Monday. With his distinctive bushy mustache and outspoken manner, he was one of the most recognizable of the world’s top oil executives. Total is France’s second-biggest listed company, with a market value of 102 billion euros. De Margerie was also a personal friend of French President Francois Hollande, who said he was “stunned and saddened” by the news. Accolades poured in from other French business leaders. De Margerie became Total’s CEO in 2007, taking on the additional role of chairman in May 2010, after previously running its exploration and production division. He said in July that he should be judged on the new projects launched on his watch, including such as a string of African fields. He also said then that Total would seek a successor from within the company. The company had not officially announced any succession plan, but said it would hold a board meeting as soon as possible. Philippe Boisseau, head of Total’s new energy division, and Patrick Pouyanne, who was charged with reducing exposure to unprofitable European refining sectors, have long been seen as potential successors. Total’s shares dipped as much as 2.3 percent on opening, but by 0740 GMT were barely changed at 42.88 euros. It was, however, still the weakest share price performance among the top European oil companies in early trading. De Margerie was a staunch defender of Russia and its energy policies, as the conflict in Ukraine has raised tensions with the West to levels not seen since the Cold War, and triggered economic sanctions against Moscow. He told Reuters in July that Europe should stop thinking about cutting its dependence on Russian gas and focus instead on making those deliveries safer. He said tensions between the West and Russia were pushing Moscow closer to China, as illustrated by a $400 billion deal to supply Beijing with gas that was clinched in May. Total is one of the top foreign investors in Russia and also one of the oil majors most exposed to Russia, where its output is due to double by 2020. Putin sent condolences, praising de Margerie’s business skills and his commitment to “the cause of promoting bilateral Russian-French relations”.